So just what is jazz anymore? Is it still an identifiable style, or is it simply instrumentation, a mood, a philosophy? These questions spring out of listening to "Give," the new album by The Bad Plus, a trio of 20-somethings whose approach to the music is so far removed from what was created in the music halls and bordellos of New Orleans a century ago that it gets one to wondering if they're really related. Still, if sharing little with Sidney Bechet and Louis Armstrong (and perhaps less with Count Basie and Benny Goodman), there is a sense of exploration and freedom here that Thelonious Monk and Charles Mingus would have dug. In fact, close your eyes and you can picture either of them sitting in with The Blad Plus and the fit being not too bad. Okay, Monk and Mingus might have had to stretch a bit on the cover of Black Sabbath's "Iron Man"  but how many bands can move from a heavy metal song (albeit turned inside out) to tackling free-jazz luminary Ornette Coleman ("Street Woman")? And then turn around with something as touchingly sweet and lush as the original "Frog and Toad" or as introspective and moody as their cover of the Pixies' "Velouria"? This trio is as unpredictable as they are talented. Oh yeah, the talent thing  the band members have it in spades. Ethan Iverson plays piano with as full and powerful a sound as anyone in jazz. He combines the unerring left hand bass lines of Basie with the blindingly brilliant classical-styled right hand of Oscar Peterson or Art Tatum. Drummer David King thrashes his set with a manic fury that wouldn't be out of place in a punk or metal band  but does so in a way that subsumes itself to the whole. And bassist Reid Anderson plays his upright like it's a guitar in a bluegrass band  laying down rhythm and harmony (and occasionaly the melody as well) all at the same time. The result is an intense, full sound that's both unique and familiar. And all three contribute two to three songs each, with these originals more than holding their own against the better-known covers. Like any label, "jazz" may have outlived its usefulness. 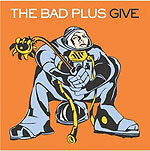 But The Bad Plus has plenty of what jazz stands for  instrumental virtuosity, improvisation, freedom. It all makes for a great listen.